Florence is a paradigmatic city for what cultural tourism means, which, on the other hand, is not to say that this very particular branch covers the entire specificity of tourist activity in the capital of Tuscany (talking about shopping tourism in Florence makes as much sense as talking about cultural tourism). However, no city or country could reach to such peaks of cultural tourism without benefiting from a consistent historic heritage, which holds true especially when it comes to Florence. Indeed, it is by force of its monumental historic past that Florence overwhelms, from a tourist point of view, first and foremost, a past the circumstances of which, troubled or fortunate, have determined Florence to inherit a huge artistic and cultural wealth reflected in both the most prized tourist objectives and in the way the city itself understands to treasure and to keep alive the spirit of this cultural asset. The historic trajectory of Florence does not necessarily start off in grandness. It was, however, founded by the great Julius Caesar in 59 BC under the name of Florentia, to an army related end, more precisely, as a place where the veterans of the Roman army could retreat after having served the mighty emperor. For about a millennium, the city oscillated between periods of prosperity due to a thriving commercial activity and periods of political anonymity, an interval pegged out by the rough dominion of the Goths and of the Byzantines, as well as by the constant conflicts between these two forces, conflicts which turned Florence into a genuine combat zone, which left serious marks on the evolution of the city, demographically, culturally, economically and politically speaking. Lombards too have had their fair share of rule over Florence, when the city underwent a major crisis, being cut off from the main commercial routes of the peninsula, which led to a decay of Florence’s economical and political significance. The period was subsequently marked by Florence’s rivalry with its other Tuscan sister cities, mainly Lucca (the first capital of the Duchy of Tuscany under the rule of the Lombards and of the Carolingian Empire) and Pisa. In its first millennium of existence, Florence also saw the arrival of Christianity which rapidly turned into a respected institution, given the first documented Christian sites refer to the Church of San Lorenzo (consecrated in 393) and the Church of Santa Felicita (built somewhere between the 4th and the 5th century). The pride of the political status of Florence begins to be fuelled around 1000 AD when the Margrave dynasty, by its representative, Hugo, chooses Florence over Lucca as a seat of the rule, tuning Florence into a rightfully fearful force in Tuscany. The political strength of the newly rediscovered Florence was largely consolidated by the increasing religious significance of the city, a council having been hosted by Florence in 1055. Also, plenty of religious establishments have been restored. The subsequent two-century period saw a much more precise organization of the Florentine society into nobles, merchants and knights, merchants being the ones to whom the city owed much of its progress and growth. The period was also the moment when the first Commune of Florence is registered, and when the construction of most of its notable bridges was carried out, as a result of the geographical expansion of the city formerly bordered by the Arno River (now engulfed by the ragingly developing Florence). 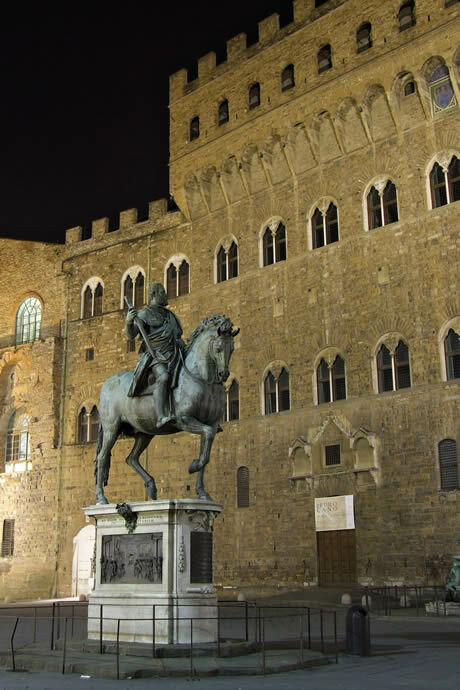 The beginning of the 13th century witnessed the occurrence of the antagonism between the Guelphs and the Ghibellines, an antagonism which rallied the people of Florence into two conflicting parties. The conflict had a sinuous trajectory given the implication of the papacy and the ascension of two other socio-political categories, the Magnati and the Popoli. All in all, despite the inner conflictions, Florence managed to make its way through in Europe by imposing the etalon of the silver and gold florin which dictated, in fact, the monetary value of all the other currencies of Europe. As a mark of the inner turbulences of Florence, it must be noted Dante himself was exiled as a result of having engaged in the conflict between the Guelphs and the Ghibellines. The bottom line is all these circumstances led to the constitution of a solid platform for the future cultural development generally known as the Renaissance, which was not essentially touched by the great plague which swept Europe during the 14th century. Amongst others, Florence has been dubbed the Cradle of Renaissance, a surname occasionally and not necessarily unjustifiably challenged by advised historians. Despite such possible invalidations, Florence has gained the right of being considered a genuine spearhead in the cultural life since the 15th century onwards. What is characteristic of the Florentine Renaissance is the return to and the revival of ancient Greek values and a prominent cult for the privileged position of the man in universe (a doctrine suggestively called Humanism). But besides the conceptual fabric of the movement, the Florentine Renaissance also saw a materialization of its theoretical tenets into an abundance of masterpieces later handed down to the city under the form of a most exquisite artistic and cultural patrimony. The Medici family can rightfully be considered the chief enablers of the Florentine Renaissance – with a peak of their vocation being represented by Lorenzo the Magnificent, and by the Florentine Platonic Academy founded by Cosimo de Medici – though the patron-of-the-art vocation was proven by plenty other notable families of Florence who, just like the Medici, afforded to sponsor the arts and culture in general by force of their wealth amassed as a result of a thriving commercial activity (which, for that matter, also opened the perspective of dominating Florence at a political level). Most people see in Michelangelo’s David (originally displayed in front of the Palazzo della Signoria, but now sheltered in the gallery of the Academy of Fine Arts in Florence) an epitome of the Renaissance, and they are partially right, though the Renaissance does not come down to a single artist and does not confine to just the sculptural expression. The cultural movement has also acted on architecture, painting and literature, for instance. Florence is said to have been a nest where Renaissance masterpieces and artists have thrived on the commissions from the patrons of the arts. Brunelleschi, Donatello, Masaccio, Filippi Lippi, Sandro Botticelli, Fra Angelico, Michelozzo, Giuliano da Sangallo, Domenico Ghirlandaio and, of course, Leonardo da Vinci, just to cite a few, have all contributed, more or less extensively, to the present artistic asset of the capital of Tuscany, by designing cathedrals and churches, palazzos and loggias, gardens and fortresses, and by embellishing them with frescoes, sculptural wonders, paintings, tapestries. The political overturns of this almost 3-century period fade in significance as to the grandness of the artistic peaks reached back then by Florence. The fall of the Medici, the rise of Savonarola and the uprising of the controversial figure of Machiavelli (amongst others, the author of the first treatise on the history of Florence), as well as the return of the Medici and the extinction of their dynasty, the rule of the Lorraine and of the Savoy were not without consequence for the political trajectory of Florence in the modern era. However, the highlight of the history of Florence in the said period is, by far, represented by the Renaissance. Again politically speaking, one major event to mark the history of Florence is the moment when, subsequently to the unification of Italy, the city became, only is just for five year (1865-1870) the capital of the country. The 20th century did not bring much to Florence in terms of development, except for a huge transformation of the architectural fabric of the city – more and more required by force of the need for shelter of the increasingly numerous urban population – which, one must admit, left untouched the patrimony inherited by Florence from its past glorious ages. A somewhat peculiar moment Florence saw during the 20th century was the sparing of Ponte Vecchio and of the Vasari Corridor (at least in part) during World War Two allegedly at the express order of Hitler himself who is said to have held in great respect the respective venues as a result of a prior visit to Florence upon the invitation from Benito Mussolini. Nowadays Florence stands out by its care to the artistic and historic patrimony, a diligence expressed by the numerous restoration works where they are necessary, by the sheltering of the original masterpieces in the plethora of museums especially conceived to this end, and by carrying on the old cultural tradition by an abundance of events and festivals which do not only revive the glorious past of the capital of Tuscany, but also continue the tradition. 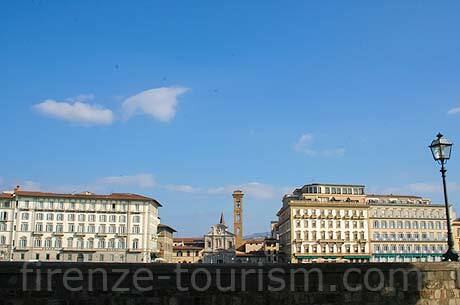 By force of all these considerations and by force of plenty others left unsaid, Florence is deemed one of the top tourist destinations in the world, which is no overstatement.